Sign up for the betas! In the past few months we’ve brought some great updates to both iOS and Mac, including a brand new release of OmniOutliner. Earlier this month we released OmniOutliner 5. With it, a brand new version called Essentials. Essentials packages the basics of outlining into a svelte, focused app for a broad audience. Ken wrote more about our intentions for the new app on launch day. Essentials, though focused, comes with a lot of brand new features: among them Full Screen and Typewriter Modes, brand new and beautiful themes, and more. We’ve priced it for a broad audience, too: it’s just $9.99. At the same time, OmniOutliner Pro is even more powerful. It includes everything in OmniOutliner Essentials, everything that makes Pro pro, and more: slide-in inspectors for full-screen mode, saved filters, customizable keyboard shortcuts, OPML mode, multi-row focus, style previews, and a lot more. PRICING: With Essentials, we’ve lowered OmniOutliner’s base price from $49.99 to an extremely affordable $9.99. And since we want our upgrade price from Essentials to Pro to be just $49.99—the cost of the old OmniOutliner Standard edition—the new list price has been lowered to $59.99. Upgrade pricing applies on every version before 5, too: $4.99 to Essentials; $29.99 to Pro. 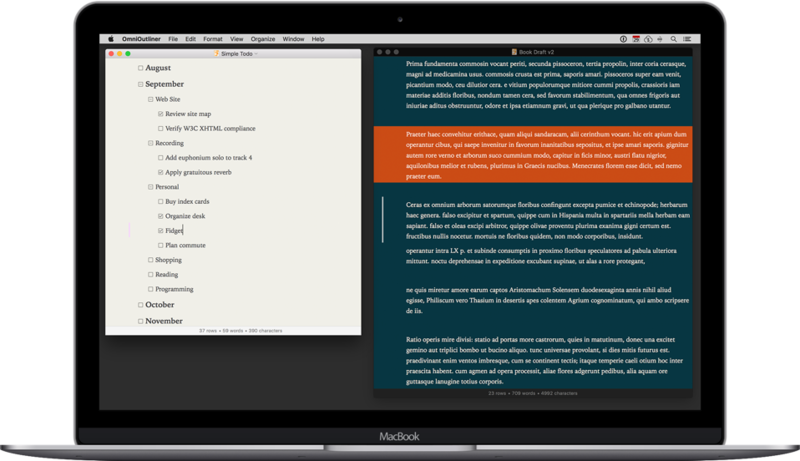 Download a free trial of OmniOutliner directly from us or via the Mac App Store to check out both Essentials and Pro. Enjoy! In March, OmniGraffle got a big update. The list of improvements and fixes is long, but the brightest star is artboard support in Presentation Mode. Take a look at its proper Split Screen support, too. It’s a macOS feature that we love to use! OmniPlan now supports elapsed time values for task duration and lead/lag time! Elapsed Duration is a special duration that isn’t calculated based on the project’s work hours, but on elapsed time instead—should help those that need to wait for paint to dry before getting started on the next task. In OmniPlan for Mac, it’s now possible to import both OmniOutliner 5 files and the TSV format. In OmniPlan for iOS, we’ve introduced integration with 1Password for iOS for entering OmniPresence credentials. Yes, another sync improvement! The improvements in OmniFocus 2.9 for Mac and 2.19 for iOS should improve sync for everyone, but especially for folks that attach files to their tasks. This release also contains a good amount of bug fixes and improvements across the board, so take a look at the release notes for Mac and iOS if you’d like. Mac, iPhone, iPad, and Pencil are trademarks of Apple Inc.